Living Space: 7200 sq. ft. 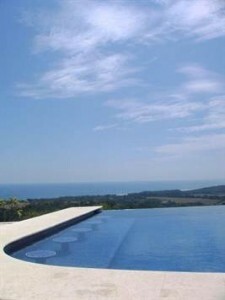 Located 1 km above the coast highway and the town of Hatillo over looking the Pacific. This two story 7,200 sq, ft home has wide open ocean views looking west to Quepos / Manuel Antonio and south to the Osa Peninsula & Cano Island. Just minutes to beautiful Guapil beach below this home comes fully furnished 3 bedrooms & 2 full bathrooms, 2 half baths. There are many custom features incorporated in to this home. Upstairs the Master bedroom has a steam room over size shower and walk in closet. Also a own private balcony. The second bedroom also has it own bath, walk in closet and private balcony. The third bedroom is located down stairs and is currently being used as an office. Down stairs there is a step down living room looking out over the ocean and the 46 x 28 infinity edge swimming pool complete with Jacuzzi jets swim up bar and solid coral stone coping. From the living room there is the dinning room with space for twelve. The kitchen is located next to the, dining room and comes complete with all Viking appliances. refrigerator, dual fuel range and granite counter tops. The ‘hard to get’ San Cristobal hard wood has been used through the house in all the doors and cabinetry. On the back side of the house there is a over size two car garage that has a attached 2 bedroom apartment below with full bath and kitchen and a 4,000 gallon water tank. On the front side of the house there is a 44 x 14 x 10 ft, full 3 car garage suitable for a boat. This garage is ready to be converted in to a 3 bedroom apartment. This house is an excellent location for a primary residence. Also with the 2 bedroom apartment under the garage, and the conversion of the 3 car garage on the other side of the house this house and property has great income rental potential.